I have recently been watching a series of documentaries with my husband (we love wild animals!) called David Attenborough Wildlife Specials. If you have Netflix it's on there! Anyways, we arrived at this beautiful bird called the Gammet, which I had never heard of before. They are miraculous creatures. They sore high in the sky and dive into the water to catch fish at 100km an hour. The blending down their neck is just beautiful, the yellow and creamy white hues are astounding. They feature this vivid blue around their eyes, as well as sharp black lines cascading down their necks. 1. Start with a clean primed lid. Then apply a white eye liner all over the lid and set it with a matte white eye shadow, I used Gesso by MAC. 2. Blend a matte yellow shadow onto the outer edge of the lid softening into the center of the lid. I used Goldenrod by MAC. 3. Create a cut crease look by mapping out your crease with a dark brown shadow, I used Handwritten by MAC. 4. Using a blending brush, soften up the crease using more Handwritten and a softer brown higher up on the brow bone, I used M2 from the Smashbox Full Exposure Palette. 5. Apply a brow highlight, I used S4 from the Full Exposure Palette. 6. Apply a thin liquid liner as you don't want to cover all your beautiful blending work. 7. Apply false lashes and mascara to the upper lash line. 8. Smudge a blue liner along the lower water line and lash line blending it up and out to follow along side your winged liner. I used Urban Decay 24/7 Glide on Shadow in Clash. There you have it! This look is bright and colourful great for summer. 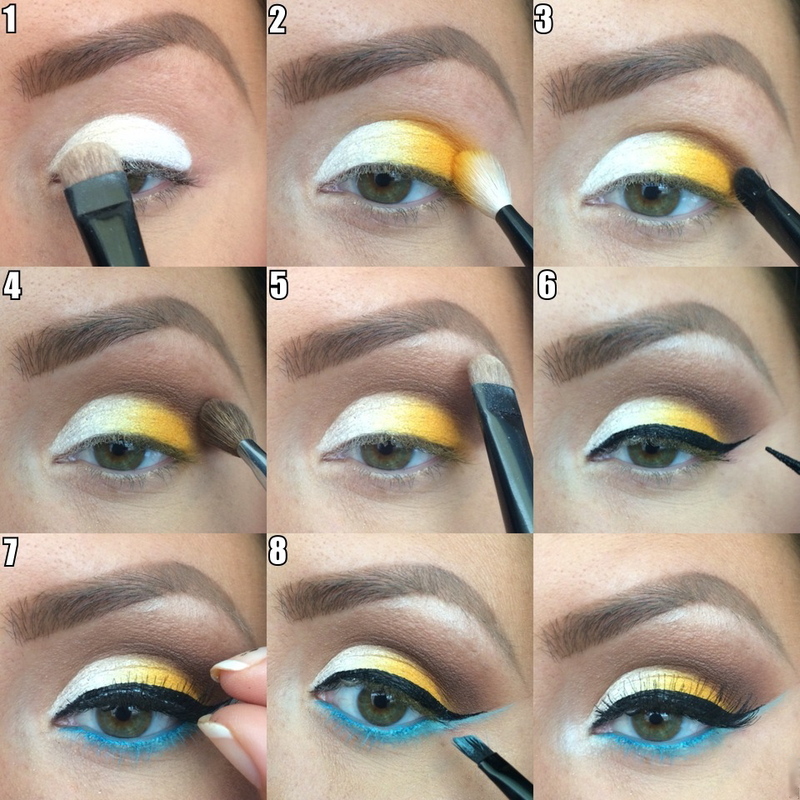 If you love incorporating colour in your makeup looks you must give this a try! As always, feel free to contact me regarding any questions you may have or to book me for your next event!